Until 2004, Petty Officers Third Class (PO3) were authorized to wear silver tie tacks or tie clasps with the United States Navy’s Winter Blue uniform, commonly called the “Johnny Cash” because of its dark color (regulations described it as “plain navy blue”). It comprised a long-sleeve shirt, Service Dress Blue trousers, neckties for male Sailors, and a variety of authorized headgear (Combination, Blue Garrison, White Hat). Chief Petty Officers were authorized to wear metal collar insignia with the uniform, while E-6 and below wore only a rating badge. Both the tack and clasp feature the same insignia design used for the cap device currently authorized for wear by E-4 to E-6 personnel on the Garrison Cap, Ball Cap, and on Eight-Point Caps not embroidered with the ACE (Anchor, Constitution, and Eagle) logo. For PO3s (E-4), this is a perched eagle with outstretched wings over a single chevron. 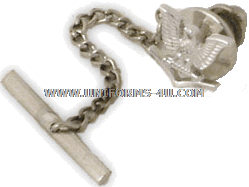 While Navy regulations do not specifically prohibit the wear of this tie clasp or tie tack with civilian clothing by Sailors currently serving on active duty or in the Reserve, they do prohibit the wear of items such as belt buckles with insignia.